What did you do in 2013 that you will remember the details of forever? Last year (OMG, that went by so fast!! ), I purchased my first car. Well, we purchased it, and technically, it's not my first car. But it is the first time that I've had to buy a car. I made spreadsheets and we did test drives and it took foreverrrrrrrrrrrrrrrrrrr. Who doesn't love The Sandlot?? Not just picking out the car, but the actual buying process. I am not kidding around here when I say that it took us 3+ hours to buy the vehicle once we got to the dealership. 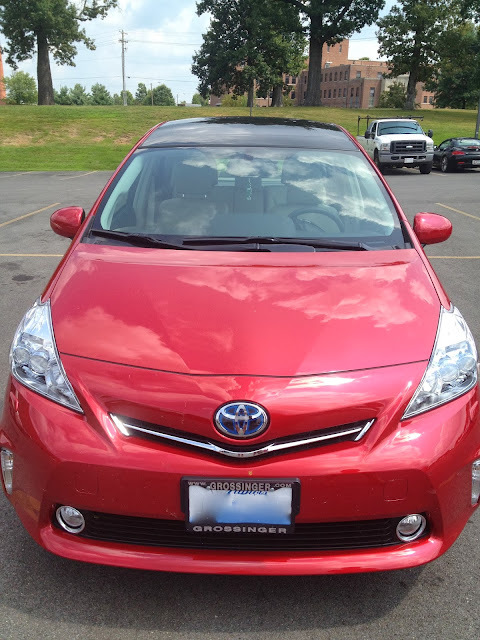 We decided to go with a Toyota Prius V Five because we liked the drive, the liked the features that came with it, with liked the storage capacity (only 3 cubic feet smaller than the Rav4) and of course, we liked the amazing gas milage. As an added bonus, the Baconator gets a family discount on Toyotas because his dad works for them down in Indiana. We walked in knowing exactly how much we'd pay for the car, and we'd even been emailing with the dealership and had picked out the exact vehicle we would be driving off the lot. There was no haggling on price, but man-oh-man, the things they try to up sell take hours. I mean, we talked to 5 different guys, maybe even 6, on the day we bought the car from the showroom to when we finally got the keys. But now that we've had our little red car for 4 months, I could not be happier. In 4.5 months, we've put over 4000 miles on it, filled up gas 10 times, drove back and forth to Evansville 4 times, road tripped to Peoria and I have filled the windshield wiper fluid. (Ok, so that wasn't actually significant). Here she is: Penny, our Red Prius! What's your Remember moment from 2013?